Application Deadline: Wednesday, November 21st at 15:00/3:00pm Eastern Standard Time (GMT -5). G(irls)20 is coming to Japan for the 10th annual Global Summit. 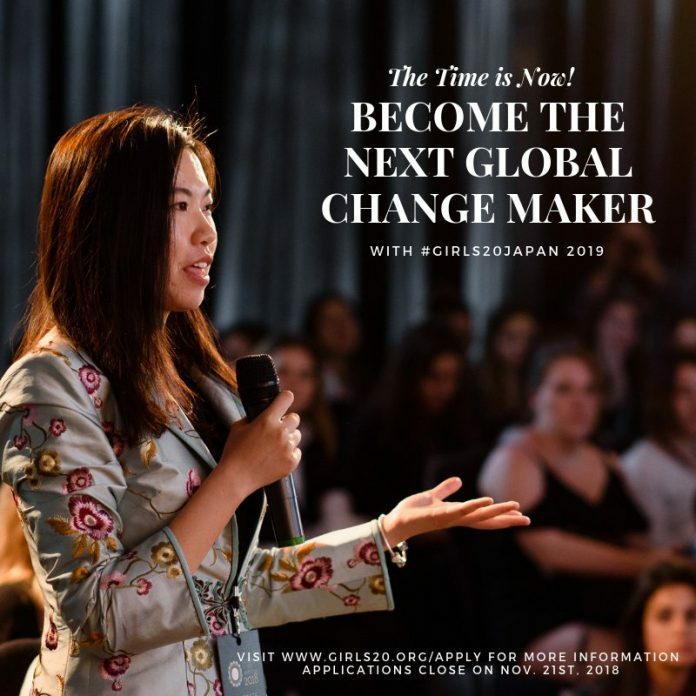 20+ young women from around the world will arrive in Tokyo for a week of leadership training, social enterprise development and mentoring by female leaders in the business and public sectors. Delegates contribute the economic and social issues facing girls & women in their countries to a Communiqué delivered to world leaders in advance of the G20 Summit and leave the Summit with increased confidence, new skills, and a global network that will allow them to make change as a community and global advocates! The Summit will be held from May 25th – 31st, 2019 (delegates to arrive May 23 or 24) in Tokyo, Japan. Please note the Indigenous delegate position is open to any young woman from around the world who belongs to a self-identified Indigenous group. Indigenous peoples, as defined by the United Nations: “are inheritors and practitioners of unique cultures and ways of relating to people and the environment. They have retained social, cultural, economic and political characteristics that are distinct from those of the dominant societies in which they live. Despite their cultural differences, indigenous peoples from around the world share common problems related to the protection of their rights as distinct peoples”.